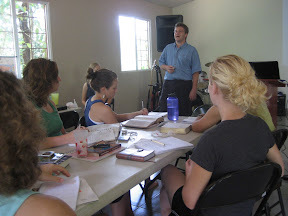 All this week, I’ve been teaching at YWAM Panama on Personal Evangelism. The class has about 15 students from 4 different countries, and I’m the last teacher of their Discipleship Training School lecture phase. They begin the outreach portion next week. The focus this week has been looking at Acts at the various methods of evangelism, and the various approaches to sharing the gospel. We don’t find a single script to use in the New Testament, but find how the gospel was contextualized to the setting. We’ve focused also on relationships and sharing the gospel in the context of relationships. Last weekend I had the opportunity to preach at the church we attend, Centro Cristiano Bethania. The services are broadcast live on the internet, and the services are televised and replayed in various parts of the world. It was a grace filled moment for our ministry. The church has 3 services over the weekend, and about 2000 members. Brenda served as translator for two of the services, and the church’s principal translator did the 3rd service. The text was simple: Follow me and I will make you fishers of men. Immediately they left their nets and followed Jesus. The associate pastor gave the invitation to invite people to follow Jesus. People came forward to begin their walk with Christ — it was truly a blessing to be involved in the proclamation of the gospel and to see people respond in faith.